Cycle safety is a hot topic in my household. Neither myself or my husband drive so when we moved out of London and were faced with Jon getting to work by unreliable, expensive, public transport (never complain about London buses again! ), we decided it was more economical, healthier and easier for him to cycle to work instead. His first job in the area was about five miles away, his new job is about three miles away. So in the last eight months he has cycled about 1600 miles (Wow!). A recent service on his bike revealed that he had snapped the back axle in half due to overuse! My father-in-law also cycles to work, about seven miles away, out of town along the A20. It's a dark, country road, notorious for traffic accidents. He's been clipped by cars a couple of times, however is pretty adamant that the lights on his bike are sufficient and there is no need to burden himself with an extra high visibility layer. So when Jon got kitted out for his job - also in a neighbouring village along the A20 - I ensured that he had all the gear: helmet, lights, reflectors, high-vis vest etc. If you could find it in the 'cycle safety' section at our local bike shop, I bought it! (Hey, I was about to give birth, I wasn't having my husband in any accidents!). In Jon's new job he gets to work using cycle paths on the pavement so he has relaxed a bit on the safety front - much to my displeasure - and chooses to leave his high-vis vest at home. (Never mind the fact that he has to cross roads on his journey). 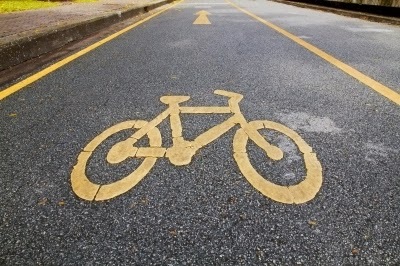 So, when the nice people at Eversure Insurance approached me to write a post on cycle safety, I was more than happy to help in raising awareness for the importance of staying safe on the roads. As we approach the shortest, darkest days of the year, it is vital that you remain seen on the roads - whether you're walking, cycling or running. I now find myself even more aware of the dangers as I walk with my buggy at 4pm - it's pitch dark and as I attempt to cross the roads - pushing the buggy out in front of me first - I realise that cars need to see me and my baby and I might consider fitting some high-vis strips to my buggy! Wear a properly fitting crash helmet. Don't cycle on the pavement (unless marked for cyclists). Always cycle with traffic, on the correct side of the road, never cycle into traffic, even if the roads are quiet. Always have front and rear lights fitted to your bike, and check that these work before setting off. You should wear light coloured clothes and high-vis, reflective clothing when cycling in low visibility, not just at night. Don’t overload a rucksack or backpack, you could reduce your ability to maintain your balance. Ride predictably, decisively, in a straight line, and well clear of the kerb. Always look and signal clearly – you can get electronic signals reasonably cheaply. Don't use a mobile phone or earphones. Consider fitting a bike horn or bell to alert road users to your presence – you can get specialist electronic horns that can cut through most background noise. Make eye contact where possible so you know drivers have seen you. I wasn't paid to write this post, I'm writing it because I think we all need to take road safety a little more seriously. Thanks to Eversure Insurance for the tips, and also for the High-Vis vests you sent me - I'm tucking them into my husband's backpack in the hope that he decides to wear them on these long, dark nights... maybe my Father-in-Law might appreciate one too? !